My girlfriend and I have begun a sometimes-weekly thing, where we'll pick out an old science fiction film and watch it, a sort of date night in. A while ago, I solicited my Facebook networks for a list of such movies that I needed to watch; the list grew immensely, and ever since, I've been picking up a lot of these older films as I find them. I've found a couple thus far: Planet of the Apes, 2010: The Year We Make Contact, Alien(s), Omega Man, Logan's Run and recently, Soylent Green. I had picked this film up, because it was on sale, but also because it has coined one of the absolute classic phrases in the genre: "Soylent Green is people! ", screamed at the end of the film by the lead star, Charlston Heston, after he discovers the truth about the food that people have been eating all along. Most of these films, I've found, have been highly entertaining ones, watched simply for their status in the genre. 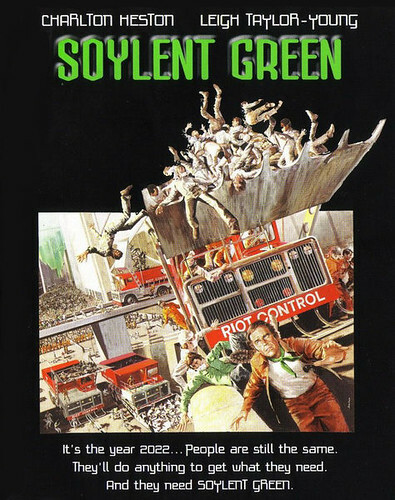 But with Soylent Green, I found, there's a very relevant message in the film: when people and nature compete, mankind will do what it takes to win, even if by winning, mankind turns to somewhat drastic things in order to continue to survive. Oddly, I was somewhat reminded of one of my favorite (and frequently mentioned) books, The Windup Girl, by Paolo Bacigalupi. Both works feature near-future societies, where human populations have overrun their natural food supplies, and in a large way, are dependent upon larger companies to feed the larger population. The Windup Girl does this in a sophisticated, modern manner, while Soylent Green demonstrates the food shortages in a particularly excellent scene when Heston's character, Thorn, confiscates a stash of food from a rich murder victim's apartment, bringing it home for his elderly friend Sol. At the onset of the film, set in 2022, the Soylent Corporation is the leading manufacturer of processed food, and is the only thing between the starving, overcrowded New York City, and total chaos of a hungry mob. Introduced is Soylent Green, created from plankton, which is rationed out to the people in the streets. Investigating the murder of William Simonson, Thorne discovers (from a report in Simonson's home) that the oceans have become depleted, and that the man had been a prominent member of the food company. The murder trail leads to a horrible conclusion: unable to cope with a vanishing resource, the company began to take dead people, and processed them as the namesake foodstuff. Unable to cope with what the company had been doing, Simonson arranged his own death. At the heart of the action and dystopia that is presented, the film is an excellent cautionary tale, one that has an exceptionally well thought-out world that is frighteningly realistic. Recently, Charles Stross wrote an interesting blog post about the number of people that it would take to maintain the current level of society. Where most of everything that we do is supported in high percentages, from the design of the cars that we drive to the medicine that keeps us alive. When it comes to food, he notes that in the 1900s, it took around twenty to thirty percent of the work force to provide food for the entire population. Now, however, it takes .5 to 1% of the population, with an additional couple or percentage points to distribute it all, to do the very same thing. Just go to your grocery store and look at what is available at your arm's length to see the variety of food. The logistical elements that go into creating everything there is enormous, automated and the nightmare of every green-eco activist who advocates for a clean living. With the preservatives, chemicals and emissions from cows that go into the whole process, there's a major impact to the world around us that just isn't visible to the average consumer. This makes the entire process far more scary, and in my mind, brings us quite closer to the worlds that have been presented in these sorts of bio-punk stories. As climate change occurs and becomes more noticeable, it's likely that the science fiction genre will begin to look far more closely at this sort of science and dystopian future as a means of creative origin. Already, it's fairly easy to point to Bacigalupi's fiction, but in other venues, such as Lightspeed Magazine, there's already been a story about a similar future, and as these stories will undoubtedly become true, it's entirely likely that a lot of these authors will see their stories come true, in some form. I don't think that I'd like to see the overpopulated world of Soylent Green or of The Windup Girl. The huge numbers of people, competing for food, and at the mercy of the food corporations is a frightening vision of the future, but in some ways, it's already becoming reality.